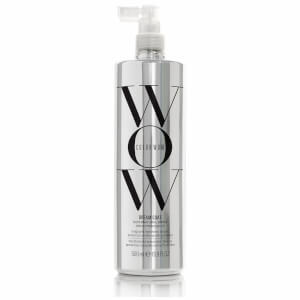 Achieve a sleek and silky texture with the Color WOW Dream Coat Supernatural Spray Supersize; a silicone-free spray that simultaneously combats frizz, controls moisture levels and smooths each fibre. The humidity-proofing treatment protects hair for up to 72 hours, or for two to three shampoos. Colour-processed hair is extremely prone to frizz due to chemicals making hair porous, however the Dream Coat formula utilises a heat-activated polymer that compresses, tightens and seals the fibre. Once heated using a hairdryer, the Supernatural Sealant envelops each strand in an undetectable, waterproofing veil, which repels moisture, whilst eliminating and preventing unwanted frizz to leave locks ultra-smooth. After shampooing and conditioning, apply Dream Coat to damp, towel-dried hair. Spray liberally and evenly on hair, section by section, and then blow-dry. Dream Coat’s humidity proofing formula is activated by blow-dryer heat and will last up to 72 hours or 2 to 3 shampoos. Reapply after 2 to 3 shampoos. If desired, Color Wow Cocktail can be applied before Dream Coat application. For best results, do not apply wet stylers to hair during Dream Coat application as some styling ingredients may interfere with Dream Coat’s humidity-proofing results. If desired, apply additional styling products to dry hair. On days in-between Dream Coat applications (after shampooing) styling products can be used on wet hair. Aqua/Water/Eau, Dipropylene Glycol, Polysilicone-29, DMDM Hydantoin, Propylene Glycol, Glycerin, Silicone Quaternium-18, Butylene Glycol, Iodopropynyl Butylcarbamate, Trideceth-7, Trideceth-12, Phenoxyethanol, Chamomilla Recutita (Matricaria) Flower Extract, Calendula Officinalis Flower Extract, Potassium Sorbate, Potassium Benzoate, Citric Acid.